On the 19th (Fri), step into the grandiose world of Agra Fort, stroll around Mehtab Bagh, and then steep yourself in history at Taj Mahal. To see maps, photos, where to stay, and tourist information, read Agra day trip planning website . New Delhi to Agra is an approximately 3-hour car ride. You can also take a train; or take a bus. In April, daytime highs in Agra are 44°C, while nighttime lows are 24°C. Wrap up your sightseeing on the 20th (Sat) to allow time to drive to Mathura. On the 20th (Sat), take in the awesome beauty at Govardhan Hill, then take in the spiritual surroundings of Sri Krishna Janmasthan, and then don't miss a visit to Krishna Janmabhoomi Mandir. To find ratings, reviews, other places to visit, and tourist information, use the Mathura trip itinerary maker . Traveling by car from Agra to Mathura takes 1.5 hours. In April, daytime highs in Mathura are 44°C, while nighttime lows are 24°C. Finish your sightseeing early on the 20th (Sat) to allow enough time to drive to Vrindavan. 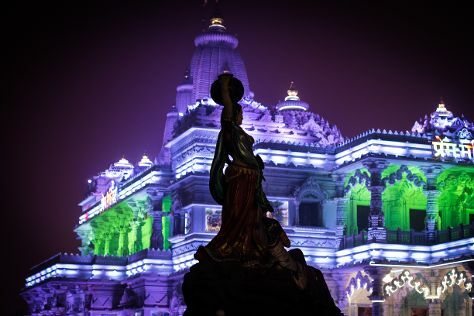 On the 21st (Sun), take in the spiritual surroundings of ISKCON Vrindavan, take in the spiritual surroundings of Banke Bihari Temple, and then take in the spiritual surroundings of Prem Mandir - Shyama Shyam Dham. To find photos, reviews, and other tourist information, refer to the Vrindavan trip maker app . Vrindavan is just a stone's throw from Mathura. Expect a bit warmer evenings in Vrindavan when traveling from Mathura in April, with lows around 29°C. On the 21st (Sun), wrap the sightseeing up by early afternoon so you can travel back home.